Gutter Cleaning Maidstone & Medway Tonbridge & Tunbridge Wells, Sevenoaks & Orpington Gravesend and Dartford, Ashford and Canterbury, Ramsgate and Margate, Folkestone and Dover. At Castle cleaning we have invested in the revolutionary Gutter Vac system. 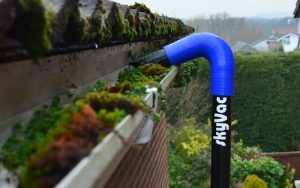 Working from the ground the gutter Vac system can reach heights of over 3 storeys and remove Leafs, moss, twigs branches safely and effectively. The gutter vac system works by a series of aluminium tubes that are bolted together and these are then connected to a high power Wet Vac system. At the “Gutter end” of the tubing are various nozzle and connectors which are designed to be used with various sizes of gutter trays. As well clearing the debris we as a company have the tools and equipment to clean the exterior UPVC of the Gutter and Soffits and Facias’. Using a high pressure washer and extendable lance a chemical will be applied to the UPVC to start to breakdown the Moss and Algae residues that are present. 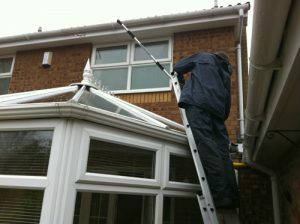 The UPVC is then rinsed to restore it to its former glory.